Summer of devastation or preservation? News > Summer of devastation or preservation? It was clear on the six-month anniversary that the government had done little or nothing to help victims of last summer’s wildfires or take the necessary measures to prevent another year of tragedy. Many of us knew that we needed to help ourselves, well before it was confirmed in May that Greece is not ready. In the past weeks, there have been fires in Neapoli, Evia, Glyfada, Stamata, Glyka Nera, Imittos (several), Ag. Stefanos, Thebes, Markopoulou, Kythera, Galatsi and Kalamos, Rhodes, among others. Fires have become commonplace, sadly to the point many are apathetic or no longer shocked unless it directly affects them. True, no country is safe. My home state of California suffers wildfires each year of greater magnitude than Greece, but the immediate and organized response by authorities is evidence that the government is ready to protect its residents. The Greek ministry’s report shows that Greece is ill prepared, with a system that is chaotic, uncoordinated and splintered amongst 29 prefectures and 45 authorities. Firemen do their best, but are short handed and some unpaid. We cannot depend on the Greek state, and the worldwide community will likely be unsympathetic as last year’s donations in the amount of 160 million for fire aid still haven’t been dispersed. As we head into a heatwave this week and high winds persist, let’s take a moment to think about fire safety. I got the impression that at least the response by the fire planes is much more determined. On the first Ymittos fire this year we had 12 Canadairs over Athens – quite a change from last year. Of course all we can do is knock on wood that last years fiasko doesn’t come back, appart from some determination in the forces, nothing has changed. As for California: They have their own little fire fighter bulls!it theatre. For ages now they (the american forest service) have fought with hands, feet, teeth and claws against getting superior Canadian fire fighting planes (the Canadairs we have here), just because they’re not “made in USA”. It even got so far that one county is leasing them from a Canadian province on their own money each summer. Υπάρχει σχέδιο των ελληνικών κυβερνήσεων για την ανοικοδόμιση των επόμενων 50 ετών. Δεν υπάρχει ελπίδα. Σχέδιο για δάση δεν υπάρχει. Μια χαρά είστε στην Καλιφόρνια. There is a Greek government plan for buildings in the next fifty years. There is no hope. A plan for trees and greening are not on the agenda. You are more nice in California. oh well. the biggest park in Europe is still happening at the old airport right? or is most of that area now going to be used for ugly concrete apartment blocks? R – We were taught fire safety when we were children, but I get the feeling this isn’t done here at school or at home. 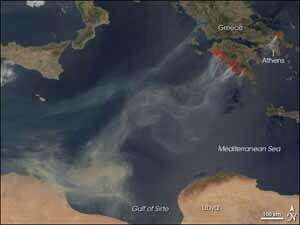 B – Sure, more firefighting planes is a good thing, but Greek media said the response was slow. Hopefully that will improve. True, CA or anywhere in the world isn’t absolved from theater, but mistakes are logged and corrected so progress has still been made despite that. Southern CA does have Canadair firefighting aircraft (SuperScoopers), but not as many as they could as you pointed out. The state has a number of existing resources: Cal Fire, U.S. Forest Service, CA Forest Service, National Guard, NASA and the U.S. military, each with its defined responsibilities and chain of command; and there are tankers on the ground as well as helicopters and aircraft (manned and unmanned) in the sky. Residents in rural areas practice controlled burning, and CA also doesn’t appeal for donations from the worldwide community. I – Your comment made me sad 🙁 But you’re right, I saw that they voted for the plan, but it did not include environmental measures, only more buildings and cement and parking lots. Krima. California is not perfect, but people do respect the land and love parks, trees and hiking. We also recycle approximately 90 percent. B – Last I heard, that was being renegotiated. There was talk that EU funds could be used to create the park, but Souflias and others poo poo’d that idea and now have that project scheduled for 2010, and I don’t think it’s been finalized. I stopped doing my monthly environmental wrap-up not only because it took too much time (and there was little interest), but I got too depressed. And not just Athens, but many areas of GR are being plowed over, illegal dumps are everywhere, and it’s going backward (coal plants, red tape for renewable sources, no windmill energy, etc.). Ok, I have to stop now. really? i was under the impression that it was finalized, and that it was going to be one of the big tourist attractions for the future, entirely serviced by rail? if not, i must say that’s hugely disappointing. They were talking about incorporating a business/conference and shopping center, which would bring money (aka, line their pockets) into the area instead of making it a total park. But as I said, I haven’t heard anything about it in while.